This award is given to one dental practice in each state to an eAssist client. These offices provide exemplary services, patient care and are valued in their community. Victory McVay is a third generation native of Arizona and holds a Master’s of Public Administration from the University of Maryland College Park, in addition to a bachelor’s from The University of Arizona and an Associate’s Degree in Fashion Design from the Emily Dickens School of Fashion in Denver, Colorado. She has over a decade working in the dental field and was the founder of Paradise Ridge Dentistry. “I am super excited to see where the practice is headed. 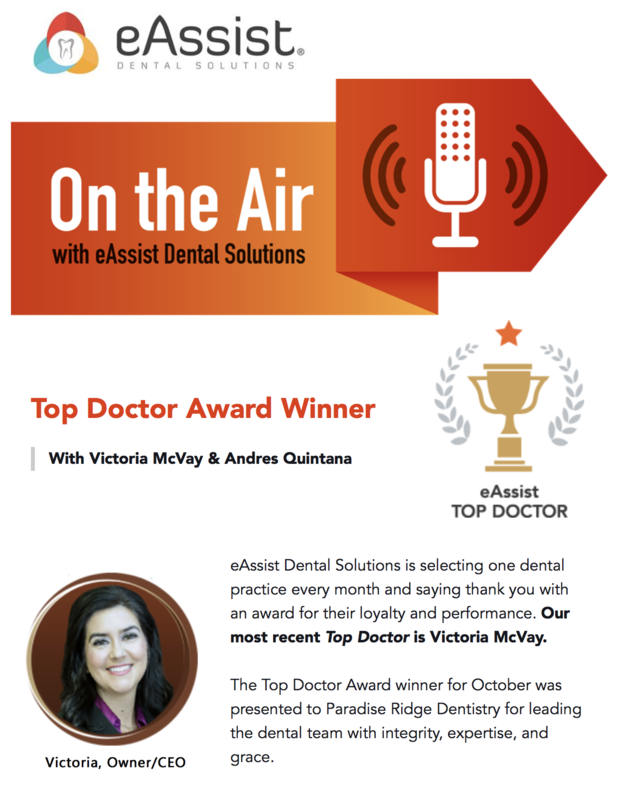 The office is very active in their community and as Tori said in her podcast with eAssist, ‘may every guest who enters leaves as a friend’ is a true representation of how this office not only cares for dentistry but the people as well,” said Natalie Rogers, an eAssist Team Member working with Victoria. To learn more about Paradise Ridge Dentistry and their office, click here!